At Howard Carter Lease Ltd we work with ALL makes and models. We can tailor an individual lease package to our client’s and or business – providing convenience, peace of mind and complete flexibility. 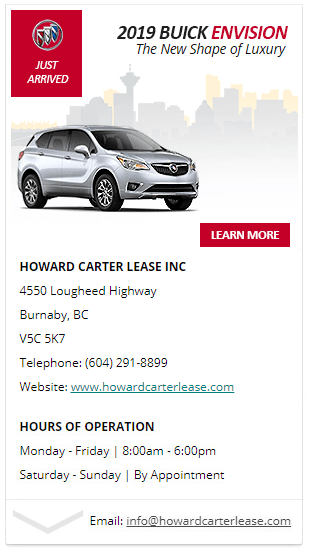 If you’re looking to lease one vehicle or a small fleet, Howard Carter Lease Ltd provides a ‘closed-end lease program’ tailored to business customers. For predictable-use commercial vehicles including trucks, vans and passenger cars – ‘the right Lease is the right fit to help your business succeed’. Is leasing right for your business? With a lease, payments may be lower than purchasing the same vehicle, since you only pay for the portion of the vehicle you use over the term of the lease. You may consider vehicles that have more options; trade in your vehicle for the latest model more frequently; and, align the lease term to the vehicle warranty period for greater peace of mind. Does leasing require less money up front? The down payment amount for leasing a vehicle varies based on the lease transaction structure and monthly payment you desire, but generally, may be lower than buying. With a lease, am I protected from possible negative equity? With a lease, you avoid the potential risk that your vehicle’s value has declined beyond its projected residual value at the end of your lease term. What happens at the end of a lease? At the end of term, you have the option to purchase the vehicle or turn it in, subject to the terms outlined in your lease agreement. Howard Carter Lease Ltd will communicate with you prior to the end of your lease to guide you through the end of lease process. Leasing may not be for everyone, but for many it’s the right fit. This information is for general information purposes only. For specific limitations, rules and restrictions on any specific financing, contact us today. WHY HOWARD CARTER LEASE LTD ? "We have a large selection of inventory (fully stocked) – new and pre-owned vehicles to choose from including; Sedans, SUVs, Compacts, Trucks and Commercial Vans (including exotic and performance vehicles). Choice and flexibility – our Lease Programs are designed with our customer’s in mind. Providing personalized service and solutions for individual and / or fleet vehicles.